Figure 1. 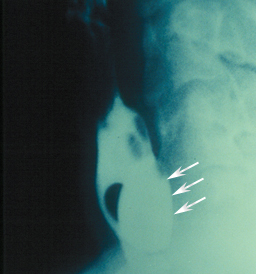 Modified barium swallow showing a 2cm Zenker’s Diverticulum (white arrows). A diverticulum is a blind sac that branches off from a cavity of the body. A Zenker’s diverticulum (ZD) is a blind sac (pouch) that branches off the cervical esophagus. It is the most common type of esophageal diverticulum. Although its precise etiology is uncertain, it is a pulsion type of diverticulum and is thought to arise from increased intraluminal pressure that is caused by incoordination of the the cricopharyngeus muscle (CPM). It occurs in an area of anatomic weakness known as Killian’s dehiscence between the lower pharyngeal constrictor and the CPM. The CPM is the lower portion of the upper esophageal sphincter. Reflux (the regurgitation of stomach acid and pepsin, a proteolytic enzyme) is thought to result in dysfunction and hypertrophy of the CPM. As the tone of the CPM increases, more pressure must be generated by the pharynx above the muscle to propel food through the CPM. The increased pharyngeal pressure causes a pouch (ZD) to develop through the area of anatomic weakness (Killian’s dehiscence). Abnormal function of the CPM can cause swallowing problems (dysphagia) without causing a diverticulum to develop. The development of a ZD is thought to be secondary to prolonged dysfunction of the CPM over many years. 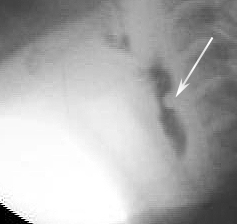 Figure 2.Modified barium swallow showing a hypertrophied cricopharyngeous muscle (CP bar – white arrow). The narrowed lumen of the upper esophageal sphincter can be seen just anterior to the CP muscle. A Zenker’s has not yet developed. Zenker’s diverticula are more common in men than women and usually present in persons over 60 years of age. Affected individuals may suffer from long-standing swallowing difficulties (dysphagia), regurgitation, bad breath, weight loss, and even aspiration (the passage of food or other hazardous material into the lungs). The diagnosis may be made by endoscopy, functional endoscopic evaluation of swallowing (FEES), or more reliably, barium esophagography. Figure 1 displays a medium sized Zenker’s. Note the pouch in the region of the esophageal inlet. Do nothing. For infirm patients with small ZD this may be the best option. Unfortunately, most patients with ZD will suffer from dysphagia that is severe enough to warrant surgical intervention. Swallowing function also tends to deteriorate over time. Transcervical surgical approach. Under general anesthesia the ZD is exposed through a lateral neck incision. The diverticulum may be resected (diverticulectomy) or tacked superiorly to the prevertebral fascia (diverticulopexy). These procedures are usually done in conjunction with a cricopharyngeal myotomy ( a procedure to surgically weaken the cricopharyngeous muscle and prevent the recurrence of the ZD). The procedure requires a general anesthetic and a neck incision. Dohlman procedure. The diverticulum is exposed with a bivalved (two-blade) endoscope with one blade in the pouch and the other blade in the cervical esophagus. Under direct visualization, the common wall between the pouch and the esophagus is ablated (usually with the carbon dioxide, CO2, laser). Endoscopic staple diverticulotomy. In our opinion, the procedure of choice for treatment of ZD. A bivalved endoscope is placed through the mouth to expose the cricopharyngeous. Similar to the Dohlman procedure, one blade is placed in the ZD and the other in the cervical esophagus. Under endoscopic visualization with a zero degree Hopkins rod telescope a GI stapler is used to cut the common wall between the pouch and the esophagus. The dysphagia is relieved, no skin incisions are required, and the patient usually goes home the same day or following morning. The Figures below display the endoscopic procedure. Endoscopic visualization through the bivalved speculum. A soft nasogastric (NG) tube was placed preoperatively to assist the surgeon in localizing the esophagus during the procedure. Endoscopic view after resection of the common wall between the cervical esophagus and the diverticula. There is no longer a blind pouch to collect food and cause dysphagia.